So now you have an all-star profile that markets you as the consummate professional to those first, second and third degree connections you have engaged with using LinkedIn invitations, introductions and groups. You have built an extensive network of contacts in your fields of interest and actually…you could choose to stop there. However, as a social media platform, to truly harness the power of LinkedIn is to access the knowledge and opportunities that are shared by its users. Creating and sharing valuable content with your network increases the number of opportunities for you to engage with your target audience, be it potential employers, headhunters or other professionals. It also builds your brand as a professional so that your network perceives you as active, engaged and thought leading. LinkedIn has a number of built-in features to efficiently display high quality content in real-time which is readily shareable with your network. These features include ‘Network Updates’, ‘Influencers’ and ‘Company Profiles’ and we’ll show you how to get the most out of them. Network Updates provide a real-time stream of data from professionals and professional sources, personalized for each member to stay up-todate on what is happening in their professional network. You can use these updates as an opportunity to reach out to your network, congratulate someone on a work anniversary, comment on or share a post of one of your connections or simply ‘like’ an update. In the same way Twitter allows you to follow politicians and celebrities as a social network, LinkedIn Influencers provides a platform for thought leaders to post professional knowledge and insights on LinkedIn. You can follow these individuals to receive content in Network Updates and email. Again, you can like and comment directly on posts and share these insights with your network. You can also follow companies as well as influencing people through ‘Company Profiles’. This feature pulls together data from the members employed at a particular company so you can find out for example which members recently joined or left a company. You can also see whom they know at a particular company in case of an introduction. Companies can also add information to their profiles including products and services updates, new vacancies and careers-related posts that are particularly useful if you are preparing for interviews at the company. Going back to school, LinkedIn Alumni offers insights about the alumni of the school, enabling members to easily explore alumni career trends, make connections and find opportunities. You may find that it’s easier to make connections using the introductions feature for your alumni compared to those third degree connections outside your network. Eventually LinkedIn could transform itself from the fastest growing professional network to the leading portal for recruitment. With the knowledge and insights you’ve gained through your network updates, influencers and companies you may have come across several interesting career opportunities at the companies you are following. By simply clicking the ‘Apply with LinkedIn’ enables you to efficiently submit your profile for job applications on company websites. In this series, we have highlighted many of the features available on LinkedIn. We have discussed how to build a positive marketing presence online. We then explored ways of developing your professional network. 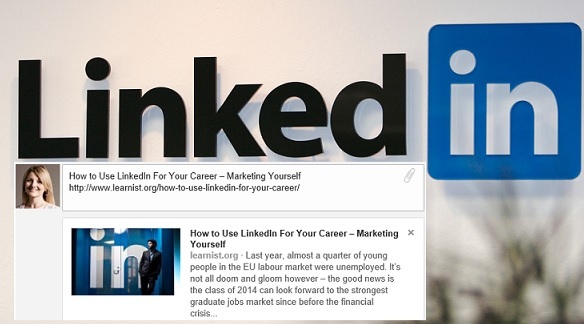 Finally we delved into using LinkedIn as a social media platform to build your brand and seek out opportunities. Along the way I have suggested strategies to make best use of LinkedIn’s tools – all of which I hope make you more productive and successful in your professional careers.